The Moving Average is the main indicator in modern technical analysis. Combining several different types of movings allows you to get different results. Almost all indicators work on the same principle – averaging readings from the last few bars of the chart. In this article, we’ll look at a trading strategy based on the Arnaud Legoux Moving Average (ALMA). This indicator works on the principle of the Moving Average, but the calculation formula is more perfect. This allows you to reduce lag, provided that the signals remain accurate. 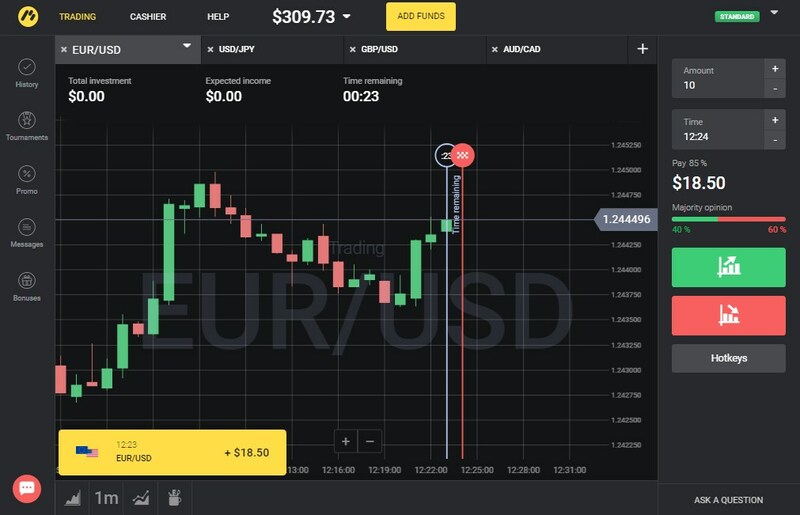 The tool was developed by Alan Hull, a trader from Australia who is well-known in professional circles. He positions his tool as an alternative to the standard MA types Simple, Exponential, etc. The main difference in regards to conventional moving averages is its minimal lag. The classic EMA, SMA, SMMA and other Moving Average lines have a significant minus – signal lag. This disadvantage becomes less noticeable if you reduce the period of the moving. However, a second problem then arises – the accuracy of the signals is significantly reduced. The MA ALMA in this regard is more perfect. On a volatile market, this tool shows very good trading results, even without the use of auxiliary filters. To trade on this strategy, we will need to open a live chart. 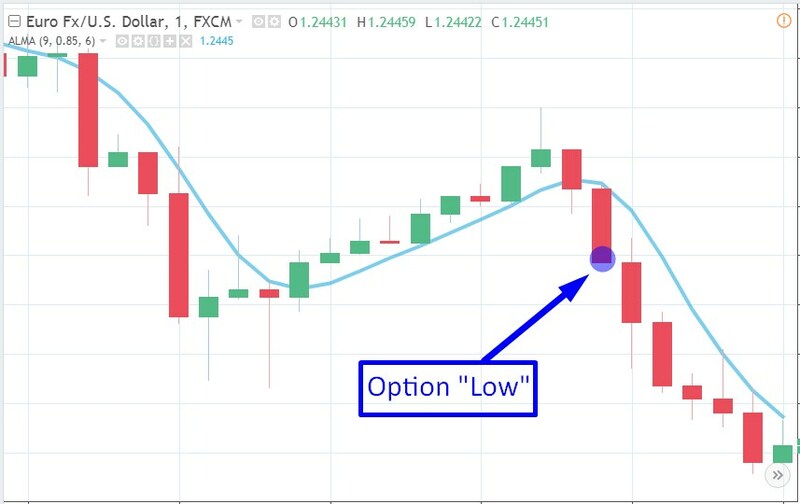 The Arnaud Legoux Moving Average is not included in the standard set of indicators, so it is not available on the trading platforms by default. So, we choose an asset from among those which offer the maximum profit percentage on the trading platform. We set the interval to 1 minute. We could put it at 5, but this would reduce the number of trading signals by several times. We add the indicator to the chart. To do this, put “ALMA” into the search line, or manually find the tool called “Arnaud Legoux Moving Average”. Leave the settings for the period at the standard values. In this article, we will consider the indicator in its pure form. Therefore, the trading rules are as simple as possible. If the price breaks through the Moving Average downwards and the rising (green) candlestick exists upwards, you should buy the “Up” option. However, it’s not as simple as just that, there are also some nuances which will be discussed below. The breakdown of the MA ALMA and exiting of the bars into the area below the movings signal the beginning of a downward trend in price movement. This is not a long-term trend but a short-term correction. More stable trends can be determined by assessing the position of the line on the graph and its direction. 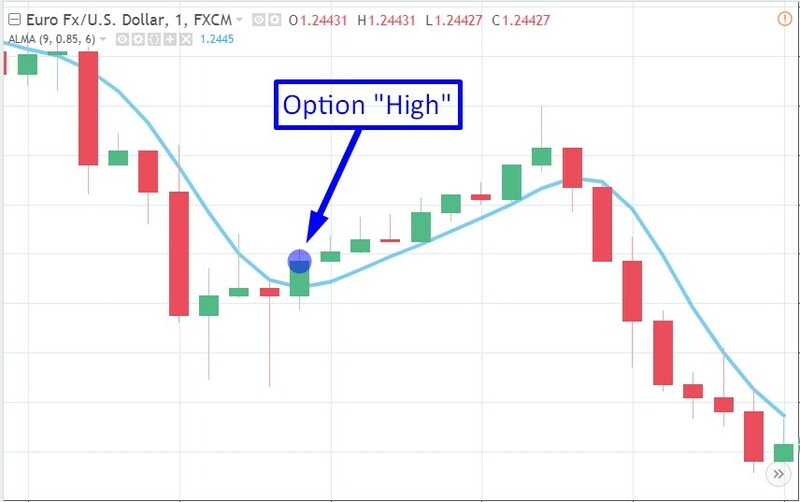 An example of a signal to buy an option on a decrease is shown in the picture of the live chart below. 1. Trading should only be done on an active market when the indicator line is directed at a downward or upward angle. This indicates the presence of an upward or downward trend. In conditions of low volatility, the passability of signals is sharply reduced. 2. The MA must be broken through by a candlestick with a body that is relatively long. Bars that are too short should be ignored. If the shadow is longer than the body, that is also a negative signal. 3. The ideal moment to buy an option is during the period in the last 5-10 seconds before the closing of the bar. This time is indicated in the live chart. 4. The expiration period should equal 1 candlestick with the chosen timeframe. We will conduct one trading operation specially for this article. We chose the AUD/CAD pair, but from a strategic point of view, that is not important. 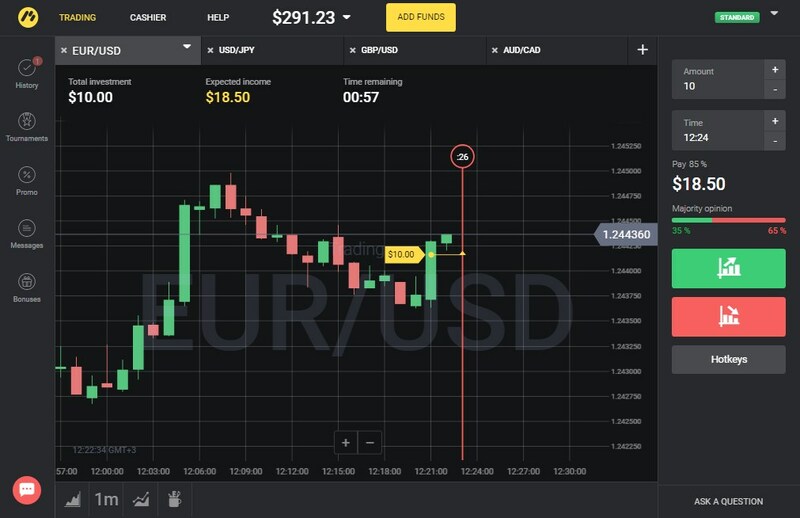 The preparatory stage has been completed, the indicator has been added to the live chart, and everything is ready on the platform for a quick opening of the trade with one click. As can be seen in the picture above, an ascending candlestick breaks through the MA going downwards. 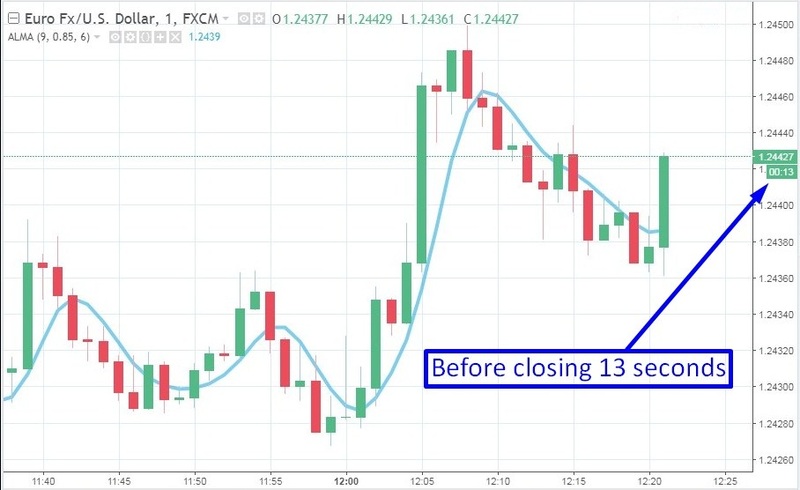 Therefore, without waiting for the closure of the bar (15 seconds left), we open a trade on an increase. Everything was prepared in advance, so we managed to open the trade. The trade lasted 60 seconds, but the screenshot was taken 22 seconds before the transaction was closed. 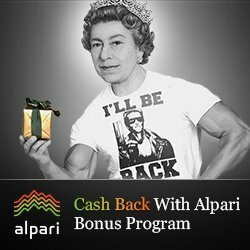 A profit of 70% of the investment is credited to our account, as seen in the pop-up notice in the terminal. Using the ALMA indicator alone allows you to get a good trading result. However, the efficiency would be even higher if additional filters were added (for example, the Relative Strength Index). The use of the RSI would make it possible to enter the market only in states of overbought/oversold, which further increases the percentage of passable signals.